New York is falling for First Hand Woman! In this whirlwind adventure, life is certainly feeling more than a little surreal. There have been plenty of highs and lows in this 9-year journey called First Hand Woman and today I’d like to share some BEAUTIFUL quotes. 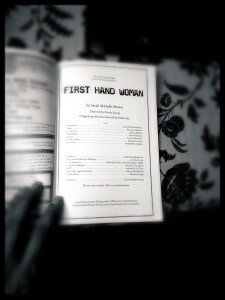 The women of this production embody its title. They are first hand women and this is a first rate show. As of today, we only have TWO more performances left in this run, so if you want to get in on this action, get your TIX now.